You're all thinking it. I just say it. It seems that the zest for life Kellie Arrowsmith paints in her book ‘Skimpy’ translates fittingly into her actual persona. Arrowsmith took the better part of two years to compile the contents of her charming novel, from conception to bookshelf. Arrowsmith began the writing venture as a blog appropriately named ‘Kels Gone Bush’. She took the stories from these blogs and edited them into print form to create her hilariously raw work. Arrowsmith began her blog in 2012 as a way to document her travels and took her passion for writing and storytelling to the next level when she put it all in print. Arrowsmith began the writing project in August 2013 and finished it in March of this year. 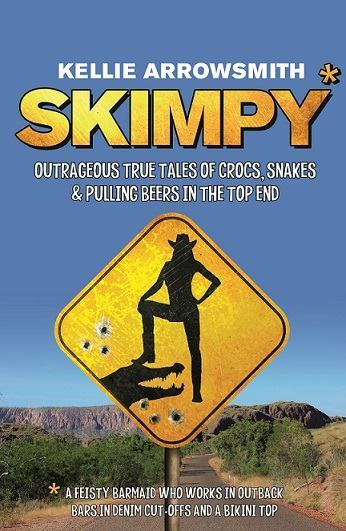 ‘Skimpy’ is the first novel for Arrowsmith and the hype surrounding it is warranted. “I did a lot of work to the book before I took it to a publisher and then I got myself an agent. I think this book is a mixture of good timing and hard work. Arrowsmith is not done yet though. Her creative journey is only just beginning with another book, a fiction novel this time, in mind. Arrowsmith has taken the antics and memories of a pivotal time in her life and made them into a book so authentic and relatable that you simply want to know this woman; you want to be served a beer by her and know every enchanting and tantalizing story that didn’t make it into the book. Where Are The Beautiful People Online At?